So for all those who still doubt whether there is space for one more news channel to make it 7 in all apart from the 11 general entertainment Kannada channels, it is only a matter of time before they are able to get an fitting answer. This debate has come to the fore with the recent addition of Public TV of former Kannada Prabha and Suvarna Channel’s News Editor H R Ranganth, to the existing stampede of channels. With one more player in the market the fight for the top slot in the small screen is going to generate more heat and the clamor for ‘breaking news’ is sure to witness a new high (or is it low?). One-time firebrand journalist H R Ranganath being at the helm of affairs at Public TV has only added more nosiness and intensity to the existing fight for supremacy among channels for grabbing eyeballs. Public TV which was went live on February 12, 2012 and 7 channels are now competing and combating with one another to climb to the top with ‘breaking news’ of every possible kind. 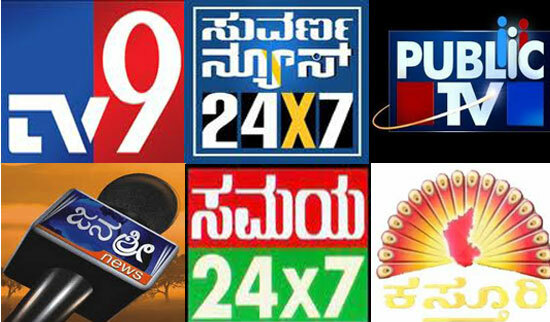 Public TV has become the 7th Kannada news channel of the state which will fight it out with Udaya News, T V 9 Karnataka, Suvarna News, Samaya, Kasturi and Janashree News channels, with each one trying new stratagem to garner public attention. How these channels will conduct themselves in the course of next few years will be crucial. In the entire fiasco the viewers will have no other option but to keep changing channels in their search for credible or unbiased channel for news and views. Nevertheless, many regular viewers of the news channels in Karnataka have expressed their views openly in favour of one or other channels. R. Bhandarkar from Mangalore opins that the craze for English in these Kannada channels are not lost. ‘Breaking News’, ‘BIG NEWS’, etc . etc. Many a times the ‘breaking news’are restraint drainers. ‘Break or be Broke’ seems to be the motto of these channels nowadays. These news contents in thses ‘breakers’ are often suicides,accidents, killings etc.These have no repititive values but are aired till one is disgusted. ‘BIG NEWS” does not even have that ‘little’ to make one sit up and watch. Many of the programmes, serials etc are ‘direct lifts’ from the more popular Hindi Counterparts. The less said of the ‘humour or comedy programmes’ the better! “Some channels have alignment with political parties, some are pro congress and some are pro BJP and some are pro communists and some are pro communual. Some channels are there to make money and blackmail by sting operations. The journalistic ethics have been compromised…Forget about the regional channel, even the national and international channels are biased..God alone knows the truth. Anyway journalism has grown very well in India and would continue to grow. But they should work in the best interest of community, peace, nation, truth and act as bonding agent between different faiths and communities…should work as watch dog against social evil practices, alcoholism, corruption, female foeticide, dowry, caste system etc etc”, writes Shahnawaz Kukkikatte from Dubai. ← South Indian Media: Why is Sankeshwar interested in Media?